The Dodecanese are located East of the Cyclades. West of the coast of Asia Minor, and North-East of Crete. It is an enchanted world, where the sun paints pictures and gives life. The mild winters and refreshing summers give the Dodecanese one of the healthiest climates in the Mediterranean. The islands of the Dodecanese are engaged in a beauty contest with no clear winner. In the summer the prevailing wind is the meltemi blowing from a North-West direction at Force 4-6. In Spring and Autumn the wind is less strong and blows from the South-East. These islands are a sailors paradise of more than 163 islands and islets. You will ﬁnd on each island unoounted beautiful beaches and bays that you should not miss. 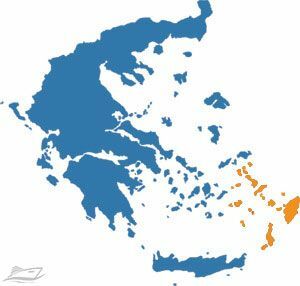 The remotest of the Greek archipelagos the Dodecanese was only incorporated into modern Greece in 1948, after 500 years of occupation by the Latin Knights of St John. the Ottomans, the Italians, the Germans and the British. Through it all the islanders have retained their Greek cultural identity. The islands’ history has left a legacy of rich and diverse archeological remains. Members of the Dodecanese display a marked schizophrenia. Dry limestone outcrops such as Kalymnos, Symi and Kastellorizo attract those in pursuit of the traditional island life while the sprawling sandy giants of Rhodes and Kos have beaches and bars galore. Nisyros and Trlos are volcanic, while Astypalea and Patmos at the fringes resemble more the Cyclades. This island group is renowned for its temperate climate and long tourist season.